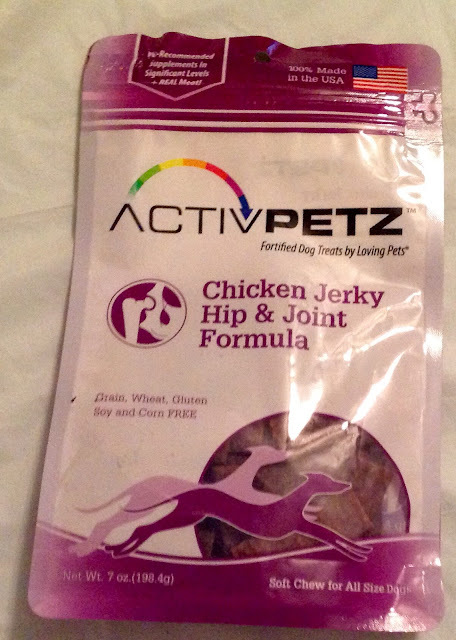 ACTIVPETZ™ Chicken Jerky Hip and Joint Formula Promote your pet's active lifestyle with this affordable treat fortified with significant levels of veterinarian recommended supplements. Beef, Vegetable Glycerin, Pea Protein, Mixed Tocopherols (used as a preservative), Rosemary Extract (used as a preservative), Glucosamine HCL, Chondroitin Sulfate. Cassandra's Review- Smaller and easier to take with you on the go these are soft and easier for a dog to chew but with a little more work, so they last more than a few seconds. My dogs really enjoy them.